It opens and closes with a rock performance, with quite a few in between, as if it's a musical. The premise that it's sold in is Ricki has to return home to her long-ago-abandoned family because her daughter is going through a divorce and isn't well. Your basic family drama, or dramedy, where mother and daughter and other family members reunite to recover from past wrong-doings to help each other get over current misfortunes. But if all is right after just one song, then perhaps we didn't need a whole movie to get there. The drama element seems to be greatly played down in order to get more Ricki. ARE PROPERTY OF SONY PICTURES ENTERTAINMENT INC. FOR PROMOTIONAL USE ONLY. I would have preferred more comedy. For a movie that should have been a comedy-drama, there wasn't a whole lot of laughter. There were a few attempted jokes, but the aim of said jokes was hard to read. Ricki made quite a few pro-America, pro-Conservative values and anti-Obama jokes, and she makes these comments as her Californian hippie musician self. Back home in Indiana, in the midwest, in the middle of America (if you haven't caught that yet), Ricki tries to be okay with her openly gay son but doesn't use the most progressive wording, and makes fun of her other son's very hippie, new-age wedding plans. The other characters in the movie don't laugh at Ricki's jokes and just sort of stare at her backwards ideals, which kind of leaves the audience in the same boat. I'm assuming the point is that not every Californian is a liberal democrat and not every Hoosier is a conservative republican – but do we really need a movie telling us that? When Ricki's relationship with her troubled daughter (played by Streep's real-life daughter Mamie Gummer) – remember, the very relationship that is supposed to be central to the movie – is down-played so Ricki can go back to California to examine her relationship with her band, it becomes much clearer that Ricki and the Flash is just going to be about Ricki and it's going to be whatever genre Ricki wants it to be. One gets the sense that screenwriter Diablo Cody got overly excited about having Meryl Streep in her movie, that the movie never became the ensemble it should have been. With a cast as deep and talented as this one, I wanted more interaction with all the characters, less interaction between Ricki and her guitar. Only a few got to shine. Kevin Kline as Ricki's ex-husband gets introduced fairly early and actually gets to have a number of scenes with Ricki. His straight reactions to Ricki's poor choices was hilarious and some subtle sarcasm was very well-timed and the audience is reminded that luckily Kline earned his Oscar years ago because otherwise this could be pretty sad. 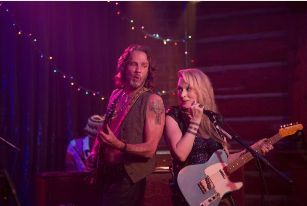 On the flip side, Rick Springfield plays Flash guitarist who is in love with Ricki, but she loves playing up a are-they-or-aren't-they relationship for the audience which she is convinced is the reason Fleetwood Mac was so popular. Springfield was a great addition to the cast because we all know him as a musician, but here he also has great romantic chemistry with Meryl Streep and very efficiently elicits sympathy from the audience with his natural and honest portrayal of an aging rock side-kick who knows and accepts who he is. The only character that gets to put Ricki in her place is Maureen (Audra McDonald) in a brilliant scene that details everything that went down in years past. It was a very needed scene because the other characters who had a beef with Ricki never said much, as if more scenes of Ricki playing music will solve everything. There was a lot of fun to be had with Ricki, and the Flash, and her family, but they seemed to have more fun than the audience did since the family drama and simple comedy that should have tied everything together ended up playing back-up to Ricki and her need for rock-and-roll. Juno (2007) - "Juno" can't live up to its undeserving expectations.